Just five days after Prime Minister Manmohan Singh promised in Lok Sabha to address the issue of pensions for ex-servicemen, the Ministry of Defence today circulated instructions to implement two pending matters. This would increase the pensions of jawans and also bring the much-awaited parity between persons who were getting lesser pension than their juniors. The Ministry has issued orders to bring about parity between persons who retired before October 10, 1997, and those who retired after that date. This will be applicable to all persons below other ranks (PBORS) of the Army, Air Force and the Navy. About 12 lakh retired jawans, airmen and sailors, who form the core of Defence Minister AK Antony’s long-term welfare measures, will be benefited. The second part of the latest instructions is to improve the pensions as per the award of the Group of Ministers in 2006. This mean the award has been accepted and orders issued in this regard. It may be mentioned that these two issues were pending since last year’s Lok Sabha polls, and even ended up creating a minor controversy. Media reports were then published quoting unidentified sources that the same had been cleared, even as the five-phase polling process was on. The Election Commission had sought a clarification and the Ministry had to clarify that the said media reports were false. Sources in the Ministry of Defence today explained that a Committee under the chairmanship of the Cabinet Secretary has considered the demands of the ex-servicemen and made seven recommendations. Five of these had been cleared and two were pending. The other five points cleared by the Cabinet Secretary and implemented by the MoD were: Inclusion of Classification Allowance for PBOR from 1.1.2006; Removal of linkage of full pension with 33 years from 1.1.2006; Revision of Lt Generals’ pension after carving out a separate pay scale for them; Broad banding percentage of disability/war injury pensions for pre 1.1.2006 disability/war injury pensioners, and Removal of cap on war injury element of pension in the case of disabled pensioners. All these moves will collectively cost Rs 2,200 crore to the exchequer annually. 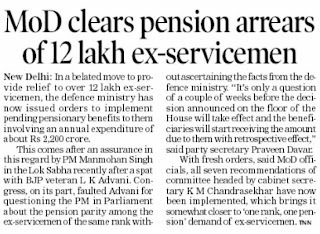 Implementation of these orders will not only significantly reduce the gap between the past and the current pensioners but will also considerably improve the pension of ex-servicemen, including disabled ex-servicemen. Last week, the Prime Minister and BJP veteran LK Advani had an exchange of sharp words over the matter. Advani has accused the government of going back on its words of helping the ex-servicemen in and implementing ‘one rank one pension”. India today dismissed as ‘baseless and factually incorrect’ reports that it was issuing an advisory to its citizens in Afghanistan to return home and is planning to scale down its presence in the war-ravaged nation. “India’s commitment to its development partnership with Afghanistan remains undiluted,” the spokesman for the Ministry of External Affairs (MEA) said. Media reports had recently suggested that India might reduce its presence in Afghanistan in the wake of the February 25 terror attack in the heart of Kabul, frequented by Indians. National Security Adviser (NSA) Shiv Shankar Menon, who visited Kabul following the recent terror attack, had also made it clear that there was no question of India bowing down to terror threats and reduce its humanitarian mission in Afghanistan. However, Menon made it clear that the Indira Gandhi Children’s Hospital, the only children’s hospital in Afghanistan, will not reopen till proper security measurers are put in place. The medical missions in Herat, Kandahar, Jalalabad and Mazar-e-sharif will, however, continue to function normal. Earlier, some reports had suggested that India was looking at various options, including paring down of the operations of its missions in Afghanistan, in the wake of terror attacks on Indians there. US Defence Secretary Robert Gates raised the possibility today that some of the US forces involved in the Afghanistan surge could leave the country before President Barack Obama’s announced July, 2011, date to begin withdrawal. 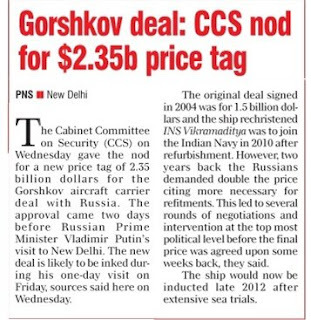 After a three-year long renegotiation, the fresh price of Admiral Gorshkov aircraft carrier was today finalised at $2.35 billion by the government, a day ahead of Russian Prime Minister Vladimir Putin’s two-day visit to India. “The Cabinet Committee on Security (CCS) that met here today has given its approval to the revised price for Gorshkov,” a Defence Ministry official said here. India and Russia are likely to conclude the fresh contract for the aircraft carrier, bought by the Navy in 2004 and rechristened INS Vikramaditya, during Putin’s stay in the Capital. The warship, purchased originally at a price of $974 million, is currently undergoing a refit at the Russian Sevmash shipyard. Since 2007, the shipyard sought a hike in the price for the warship’s refit programme and had revised the cost of the project twice to demand $2.9 billion. However, India had conveyed that it would not go beyond $2.2 billion as a revised price for the project. After renegotiation of the price for three-long years, the two sides finally arrived at a figure for the refit programme six months ago, but it had to go to the CCS for a final stamp of approval, which it received today. Along with the warship, India had also bought 16 MiG-29K naval fighter aircraft for $526 million. The first four of these fighters were delivered to India on December 4 last and were inducted into the Navy on February 18 this year. 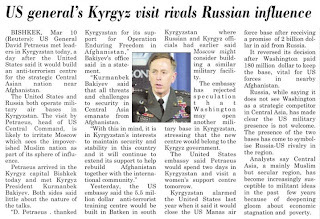 There have been a number of articles in the print media on the functioning of the National Security Council and the role of NSA. Most of them have emphasised the need for reorganisation of NSC and its substructures as well as for redefining the role of NSA. Before considering these issues, a professional analysis of the objectives of NSC and NSA’s role is essential. It is crucial to note that the functions and responsibilities of NSC and NSA have undergone significant changes in the last 11 years of its existence. The Task Force of Sri K.C. Pant had recommended a Planning Commission type organisation to act as a government think tank on security issues. It suggested that the NSC should develop strategies keeping in view the security requirements in the next 5 to 25 years. Such projections were considered necessary to determine our military doctrines and develop plans for the acquisition of technologies and weapon systems, calibrate our nuclear doctrine, modify our foreign policy to develop leverages in the target foreign countries and to take appropriate steps for strengthening our comprehensive national strength. To carry out its tasks, the Task Force had recommended that besides the National Security Adviser in the rank of Cabinet Minister, there should be three Dy NSAs in the rank of Principal Secretary for intelligence, coordination and planning wings. Each of the wings was expected to have full-time members (experts in different fields) to be appointed for 3 to 5 years. The National Security Council was set up in 1998, albeit on a smaller scale in terms of staff. The notification clearly laid down that the NSC’s role was to advise the government on security issues, which included internal and external threats, food security and threats to atomic energy, space and high technology as also patterns of alienation in the country. The role of the NSC did not include any executive responsibility. NSA was assigned the responsibility of functioning “as the channel for servicing the National Security Council.” NSA was expected to give directions to the National Security Advisory Board (NSAB) comprising experts in different fields to focus on priority areas and also to get required papers prepared for consideration by NSC. The Strategic Policy Group (SPG), a body of Secretary-level officials from the key ministries, was tasked to act as the principal mechanism for inter-ministerial coordination and integration of relevant inputs in the formulation of national security policies. However, soon after the establishment of NSC, NSA and NSCS were given additional responsibilities, changing the nature of NSC from a think tank to an executive office. After the Kargil conflict, the Group of Ministers gave NSA the responsibility of chairing the Intelligence Coordination Group’s meetings. This body was meant to ensure that the consumers got their requirements from the agencies. It was also expected to evaluate the performance of the agencies. NSCS was expected to project the requirements of the consumers to the intelligence agencies. In addition, the newly created National Technical Research Organisation, the technical unit to support the entire Intelligence community, was placed under NSA. And when the Nuclear Command Authority was created, NSA was given substantial responsibilities connected with it. If NSAs in the past could carry out all the tasks dexterously, the credit goes to their high calibre, competence and rich experience. However, overburdening NSA and NSCS with administrative responsibilities would not be conducive for the growth of NSC as an institution to undertake long-term planning – the very purpose of its formation. Moreover, growing complexities in the security environment would make these tasks further taxing in the coming period. In fact, the tasks of NSA and NSCS are of higher nature than the executive functions. They have to objectively review governmental policies and the manner in which they are implemented and suggest changes and modifications to achieve our national objectives. Expectations from NSC and its substructures is that together they would act as the “Chankya mind” to provide “out-of-box” thinking to the government. Releasing NSA and NSCS from the pressures of administrative responsibilities is essential to facilitate them to concentrate on the basic objectives of NSC to anticipate security threats, suggest coordinated strategies to deal with such challenges and recommend measures necessary for enhancing our comprehensive national strength. While NSAs and NSCS have been sensitising the political leadership on important current threats like the possibility of the use of chemical, biological, radiological and nuclear weapons, various dimensions of terrorism, implications of growing circulation of fake currency and unrestricted flow of foreign direct investment, now in the present security environment they should also sharply focus on food, water and energy security issues — necessary for building our comprehensive national strength. There is also an urgent need for streamlining the functioning of other two substructures of NSC viz. SPG and NSAB. The SPG is often replicating the task of the Core Group of Secretaries on security matters because of lack of clarity of their charters. The responsibilities of these bodies are entirely different. While the latter deals with current security issues and takes necessary decisions for implementation, the former is meant to “provide relevant inputs in the formulation of national security policies, to act as the principal mechanism for inter-ministerial coordination and to undertake long-term strategic review”. For these tasks, the NSA has to provide directions on a continuing basis and NSCS has to provide necessary assistance. For these objectives, NSA must regularly attend SPG meetings. In the past, a few meetings were attended by the previous NSA, Mr M.K. Narayanan, and he was able to provide directions to the members making the discussion meaningful and was also able to get relevant inputs from the ministries/agencies. NSAB is not fully utilised in the tasks of NSC. Its closer integration in the preparation of policy papers is highly desirable. For this, more frequent interaction between NSA and NSAB and provision of a dedicated research staff to assist NSAB are essential. The idea of having a few full-time members should be given a serious consideration. What is required is not the reorganisation but the reorientation of the NSC and its substructures to the original charter. NSA has several responsibilities in the NSC system, which require his undivided attention. Moreover, if NSC and its substructures are directly involved in certain tasks, then objective review of those tasks would not be feasible. Russian Prime Minister Vladimir Putin [ Images ] comes here on Thursday for a visit lasting less than 24 hours, during which period Prime Minister Manmohan Singh [ Images ] is likely to request access to nuclear reprocessing technology, which the US remains hesitant about transferring to India [ Images ]. Sources in the Indian and Russian establishments said a slew of agreements would be signed during the short visit, led by an Inter-Governmental Agreement on nuclear cooperation, as well as a related memorandum of understanding in technological and scientific cooperation. 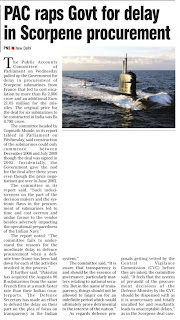 Separately, not in the presence of the two PMs, leaders from both sides would sign an agreement fixing the price for the 'Admiral Gorshkov' aircraft carrier at $2.35 billion (Rs 10,700 crore), thereby ending the sometimes unseemly negotiations over six years, which often became a battleground in the media. Both sides would also sign agreements on the fifth-generation 'stealth' aircraft being jointly produced by India and Russia [ Images ] in Russia, as well as those for creating a joint venture for a multi-role transport aircraft. The accent on joint cooperation extends to space, with an agreement on detailed cooperation on the development of a new generation of satellites linked to the Russian Glonas navigation system. The extremely short duration of the visit means there is no overt trade element, with business chambers being kept out and the India-Russia CEO Business Council — led by Reliance Industries [ Get Quote ] Chairman Mukesh Ambani [ Images ] on the Indian side and Yevgeny Yevtushenkov of the Sistema/MTS mobile service provider on the Russian side — not meeting this time as they did on the margins of the PM's own trip to Moscow [ Images ] in December 2009. However, an agreement at last on simplification of visa procedures between the two countries could mean both sides have resolved the prickly issue of 'domicile' — where Indians trying to illegally travel to the West would often use Russia as an intermediate country, provoking official discord — thereby becoming the stepping stone for both business travel and tourism. Russian and Indian sources point out, however, that despite the lack of an overt business element, bilateral trade is touching $8 billion (Rs 36,400 crore) and within sneezing distance of the $10 billion (Rs 45,000 crore) target by the end of 2010. In fact, separate commercial contracts for two more civil nuclear reactors of 1,000 Mw each would also be signed during the visit, for the Kudankulam site in Tamil Nadu, where Russia is already building two reactors and had promised to build another two. This brings the number of reactors at Kudankulam to six (at 1,000 Mw each). Another site, at Haripur in West Bengal [ Images ], had already been allotted to the Russians, with the accompanying promise that they could build another six reactors there. It is already clear, nevertheless, that the Putin visit will be remembered for Manmohan Singh's likely request that Russia provide nuclear processing technology for use in the safeguarded plants that India is planning to import from a number of countries, including the US and France [ Images ], in the coming years. The big question on everyone's lips today in Delhi [ Images ] is whether or not Putin would accede to the PM's request and reinforce the strategic partnership with India — the first in a string of strategic partnerships that Delhi signed with the rest of the world in the past decade. The PM's request to Putin becomes more significant in the context of the prolonged negotiations between India and the Obama [ Images ] administration in the US on their own nuclear reprocessing agreement. Although differences are said to have narrowed considerably, strategic analysts are delighted at the fact that the Americans rolled back years of discrimination against India by signing the landmark nuclear deal with Delhi in 2008, while the Russians are completing the circle by providing technologies to India that will help reprocess spent fuel from civilian, internationally safeguarded reactors. Russian sources note that Moscow had, in fact, already agreed to provide nuclear reprocessing and that the language of the Inter-Governmental Agreement (IGA), initialled between the two PMs during Manmohan Singh's visit to Moscow in December – the same agreement will now be signed between the two sides — allows for its sale and transfer. But, the Indian side seems nervous about the fact that the IGA language regarding the transfer of nuclear reprocessing technologies is somewhat vague, and that the possibility of denial could still exist. Indian sources said they want to plug every loophole and this is why the PM will likely make his unusual request to Putin. The fact is, the Russian PM's visit is heavily loaded in favour of government-to-government business, with nuclear, defence and space hogging the agenda. Other agreements include two MoUs on cooperation in joint ventures in pharmaceuticals, and an agreement on standardisation in pharmaceuticals. Commerce ministry sources said the two pacts on pharma products were aimed at the industry which had held its own despite the recession and grown to become India's largest export earner to Russia over the past two years ($298 million in 2007-8 and $326.69 million in 2008-9). Fertilisers were the biggest import ($274 million in 2007-8 and $1,602 million in 2008-9), followed by mineral fuels ($478.5 million in 2008-9) and iron and steel ($532.8 million in 2008-9). Nandan Unnikrishnan, Russia expert with the Observer Research Foundation, pointed out that unlike India's thriving, private-sector relationship with the US, the Indo-Russian relationship was almost entirely driven by the two governments. "Everybody talks about the wonderful friendship with the Soviet Union and how Russia continues to play an important strategic role in the development of Indian defence, space and nuclear industry. But, unless both sides think of how to enthuse the private sector, whether in the joint exploration and exploitation of hydrocarbons, fertilizers, designing components in civilian aircraft, etc, the relationship will show a declining graph," Unnikrishnan said. "Prime Ministers Manmohan Singh and Putin may believe that India and Russia are important for each other, but unless Delhi begins to change its mindset that Russia is a declining power and that two friends are better than one, the other of course being the US, ties with Moscow will remain unstable," he added. March 10, 2010: Although it won’t complete all its acceptance tests for another three months, the Indian Army has already ordered 443 of the new, Indian made Nag ("Cobra") anti-tank guided missiles (ATGM). The last tests will confirm (or not) that the missile can hit targets at its minimum rage of 500 meters. In these situations, the missile guidance system has only two seconds to lock on to the target and hit it. Nag will mostly be on vehicles, to provide mobile anti-tank units. The Nag was designed for this, with a larger warhead and longer range. Nag uses a thermal imager, and at the press of a button, the operator gives the missile guidance system a picturte of the target. The missile is then fired, and automatically homes in on the target, using the thermal imager picture as a reference. The air launched version will eventually have an upgrade that will enable to launch the missile first, and find the target later, transmitting the target picture to the missile, which will then go after the target. At maximum range, Nag is in flight about 30 seconds.